Having toyed with the Care Labels For Humans concept for nearly four years, I decided that 2018 was going to be *the year* when I made some real progress. If you’d like to take part in the next prototyping on Sunday 14th January, then you can sign up to be a participant here. Please note that although this is Manchester Girl Geeks event it is open to all genders (those under 14 need to be accompanied by an adult). 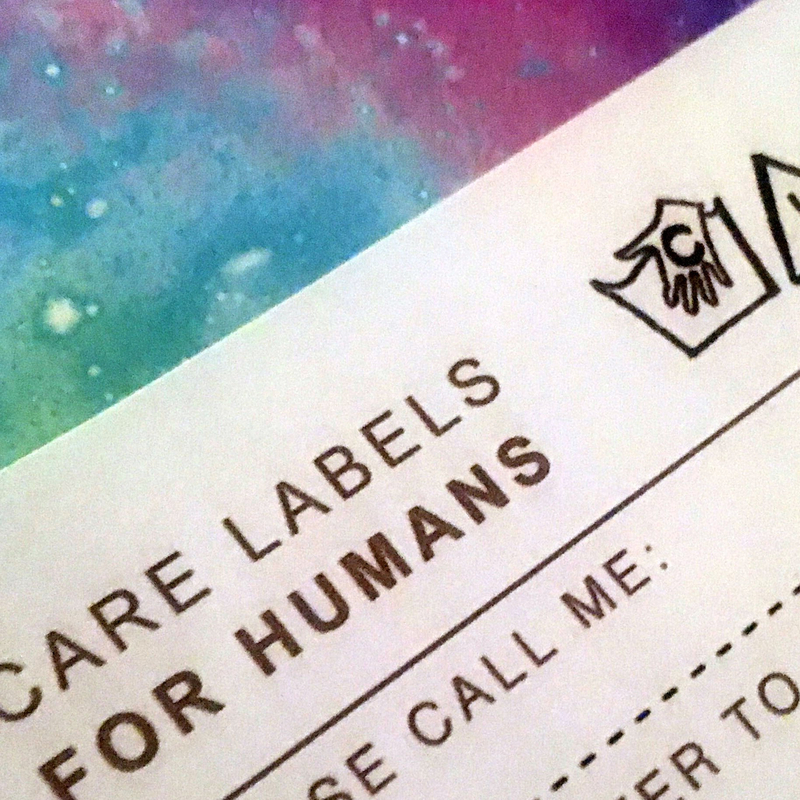 Back in October 2017, I gave my first paper prototype for Care Labels For Humans its first test at a Geek Mental Help Week event held with Manchester Girl Geeks. I really loved testing the first prototype with a small group of engaged people, it’s amazing how much I learned from a relatively unstructured session. My favourite thing about testing the prototype is when people break my ‘system’, as it gives me so much insight into how creative people can be when it comes to expressing their needs. This badge took the ‘toxic’ symbol, offered as one of the A (Approach) labels and repurposed it to express their passion for physics. As well as having had the chance to mull over the findings from the October test, I discussed the Care Labels concept with lots of different people. I’ve been delighted by the positivity of so many people, and these discussions have allowed me to add features which deepen the Care Labels experience. The badge back for the Care Labels is now much bigger and worn on an A6 lanyard rather than fixed to an item of clothing. The badge front has space for the wearer to display more than one C (conversation) label, as well as options for those who do not wish to engage in verbal communication. Participants will also be able to customise their Care Labels to suit their mood. There’s a back to the badge! I’ve introduced an extra element which allows the wearer to display some additional label types, but only to those they really want to. I’m not going to say too much more here or it will spoil the fun! Please come along and join in the experiment at Virgin Money Lounge in Manchester city centre for our Blue Sunday event. 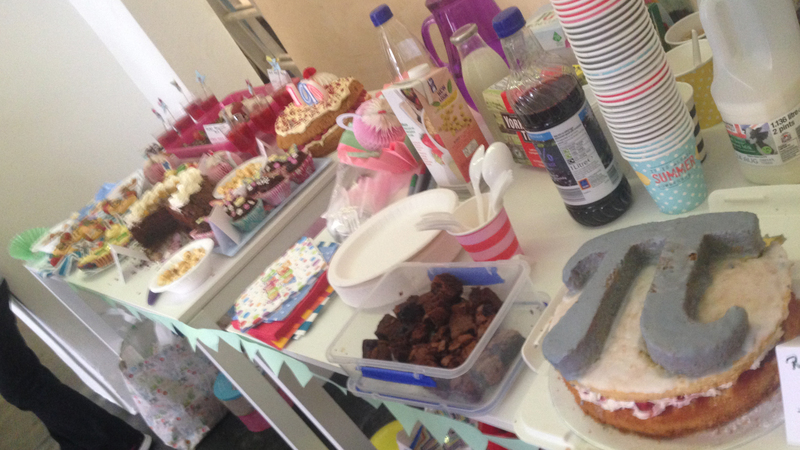 Tickets are just £3 and include tea, cake and a ‘lean coffee’ talks session. I’d like to give a massive thanks to everyone who attended my workshop on ‘Mood Nudges’ as part of Manchester Girl Geeks (MGG) event for Geek Mental Help Week. I’ve written about the workshop in more detail on the MGG website, where we used exercises from Jon Cousins’ Nudge Your Way to Happiness: The 30 Day Workbook for a Happier You to generate simple mood-boosting ideas. You can read more about what we did in the workshop here. At the end of the workshop I alluded to some recent research Jon that suggested the Mood Nudges 30 day programme made a real difference to those who completed the workbook. We set out to understand whether using the book Nudge Your Way To Happiness can help people who are clinically depressed. takes 30 days) would we see a difference? The test we used, called the PHQ-9 – the 9-item Patient Health Questionnaire) – produces a score between 0 and 27, with 0 meaning no depression, and 27 representing the most severe depression possible. The score range is divided into five bands that, apart from the highest division, are drawn at five-point intervals. Healthcare professionals use the PHQ-9 to help decide, in part, what treatment – such as antidepressants or psychotherapy / counselling might best help a patient. They also ask patients to complete the test as one way of determining whether or not a chosen treatment is working. When the PHQ-9 is used to measure progress, the rule of thumb is that a reduction in score of 5 points or more over a period of 4-6 weeks means the current treatment regime is working, and should therefore be continued. We asked 51 people to use the book for 30 days, completing the PHQ-9 before they started, and again when they’d finished. The participants were a randomly chosen subset of readers of the Moodnudges blog who weren’t pre-selected on the basis of being depressed, so the sample included a range of individuals from those who had only the most minimal depression to others who were experiencing moderately severe depression. The results, which can be seen in graph form, show two important findings:1. Across the board, the average reduction in PHQ-9 score over 30 days was 5.3, suggesting that using Nudge Your Way to Happiness can be as clinically effective as antidepressants or psychotherapy. 2. 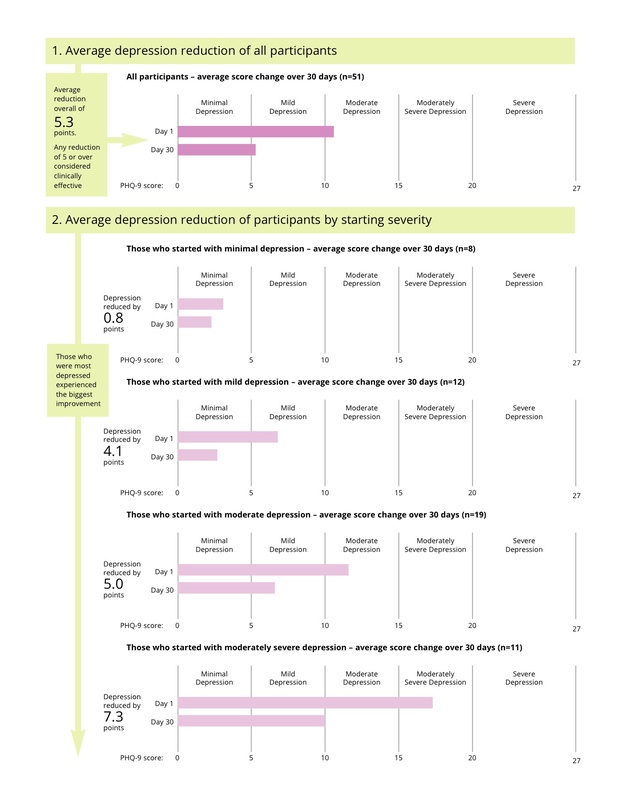 The greatest reductions in score were seen in those who were most depressed to start with. On average these participants’ scores fell from a level definitely placing them in the Moderately Severe category to one at the very lowest end of the Moderate division: only a whisker away from being labelled Mild. Future work could involve working with a larger sample, and structuring the study as a randomized controlled trial. But these early results do seem promising. Find out what we did at the Mood Nudges workshop for Geek Mental Help Week hosted by Manchester Girl Geeks. Thanks to Mark Brown aka @markoneinfour and my brother Ellis for helping me develop the workshop format. It’s the last day of January and I still haven’t committed my New Year’s resolutions to digital pen and paper. I’ve needed to mull them over, organise them and let them settle. I am not telling myself that I have to do all of these things. The list will also serve as a reference for longer-term aspirations. This doesn’t just mean on my blog, but in my personal journals. Taking time to reflect on events and share my experience in a way I find comfortable. Remembering that in an age where we can send a sentiment in a few seconds by text or messaging, the effort put into sending your thoughts through a physical medium speaks volumes. I have been working hard for some time to find a healthy balance in what I eat an drink and continue to be guided in this. Today I made my first green juice. Something I do already, but need to establish some firm habits. Went to my first Pilates class in an age this morning. It was tough but exhilarating. I got a FitBit. It tracks lots of things like heart rate and sleep, but also very tangible and motivating things like daily number of steps and flights of stairs climbed. I’d like to walk at least 6,000 steps even on the most sedentary day. I haven’t done this for quite some time and it will be interesting to see how the Mood Meter data fits in with what the FitBit captures in terms of wellbeing. I use iCal to set mini prompts for me each day to make sure I maintain balance in life. These change from time to time so I need to get rid of any reminders that just aren’t relevant any more. I’ve been experimenting in Google Calendar with a way of colour coding activities depending on how demanding they are so I can get balance across the week. A definite work in progress. Pick up the phone more often and meet friends in person. It’s too easy to rely on the convenience of email and messaging to make contact. Happily I have achieved this already. I put on a ‘Meet the Bloggers’ event as part of Manchester Girl Geeks last weekend with six fabulous speakers. The room was packed the other volunteers, and folks at MadLab, made it a great and popular session. Me (front), with the Meet the Bloggers line-up. From left to right -Gill Kieran, Claire Gowler, Rosie Campbell, Natalie-Claire, Clare Sudbury and Sophie. The event stimulated a lot of conversations between the bloggers and guests which carried on into social media after we’d wrapped up for the day. I was particularly delighted when one of the attendees, Chrissy, wrote about how the panel discussion given the confidence to promote her own blog Making It Mindful. Well, “Why wouldn’t you want to interview Helen Arney?”, you might ask? Of course she is super-smart, funny and chic, that’s undeniable. Which is why, when I was booking my tickets for Festival of the Spoken Nerd at The Lowry, I was struck by the fact that she did not have a Wikipedia page dedicated to her. Almost a year before the gig, I’d been to a Wiki Edit workshop run for Manchester Girl Geeks by Wikimedia UK. What did I do with this knowledge? Pretty much nothing until I noticed that Helen Arney didn’t have a Wikipedia page. Fellow Manchester Girl Geek Karen Pudner (@kpudner) had created a Wikipedia page for code-breaker Joan Clarke, who worked alongside Alan Turing on the Enigma Project at Bletchley Park. 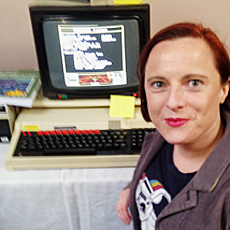 Karen started the Wikipedia page in 2013 having attended a previous Manchester Girl Geeks Wiki Edit Day. This was the year before Joan’s contribution to the team at Bletchley Park was recognised in The Imitation Game. Since then the page has been added to and edited by dozens of other users. If another girl geek could write a woman into Wikipedia then maybe I could give it a shot? I was so excited by the prospect that it was with some abandon that I launched into writing my first lines of words on Wikipedia. So I’ve made a start on Helen Arney’s page, which is currently a described as a ‘Singer stub’. If you would like to add an edit of your own I’d be extremely happy. So, why did you interview Helen Arney? As well as her obvious fabness (see above), I thought it would be lovely to have something that I had written to be linked to from the Wikipedia page. And reciprocal linked (of course!). You can read what Helen had to say on physics, funnyness and frocks right here. 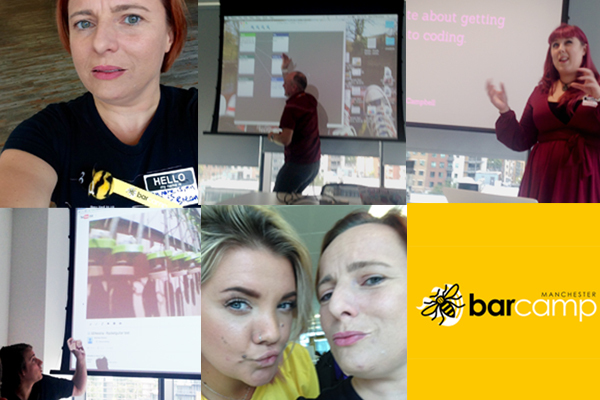 I was lucky enough to attend the first day of BarCamp Manchester 2015. Having been to the previous year’s event at SpacePortX, I expected great things. I wasn’t disappointed. The venue was AutoTrader, the same place we used for Manchester Girl Geeks’ Mini BarCamp (aka BraCamp) back in May. Massive thumbs up to @GirlGeekUpNorth and her fabulous team for putting on the best event of this type that I’ve ever attended. I’d like to pick out a few highlights from Day 1. With it being an ‘unconference’ format where speakers are giving talks in a number of rooms at the same time, it feels important to say that there was lots of brilliant presentations / discussions I didn’t make it to. Check out the @BarCampMCR Twitter feed for a fuller picture. If you haven’t heard of a BarCamp before @teknoteacher does a good job of explaining how it all works (film shot by @ColetteWeston). This was a strong theme at this year’s events with @GirlGeekUpNorth demo-ing “The Dark Room” an interactive video-based adventure game built by linking YouTube videos together. This is fiendishly difficult to complete. You have been warned! Elsewhere, @teknoteacher was giving a very quick tutorial on using storytelling software Twine to teach people who are new to coding how to create their own text-based adventures. A great little session by @stecks @aPaulTaylor and@Andrew_Taylor running through the most common types of clues for cryptic crosswords and how to identify them. I haven’t done a crossword for ages and this really rekindled my interest in them. Computer programming is always a popular area at BarCamp, and a lively debate was provoked by @RosieCampbell‘s talk on stereotypes applied to coders. This branched into a fierce discussion on whether computing should be taught as part of the curriculum. So, @tdobson and @czmj2 live in a van. They both have full-time jobs, so how have they managed? A great story about how they’ve made it work for them. Cue lots of questions re parking, sanitation and wireless connectivity! Next to @erinmaochu‘s ‘Crowdsourcing a recycled Manchester robot orchestra’, a project which will be part of the line-up for Manchester’s stint as European City of Science in 2016. It was great to witness the potential for collaboration erupting in the room as several people, including @matthewshotton, excitedly shared their own experiences with robotics and music. Yes, I have been very quiet of late. After moving into my new fab home I wanted some time just to be in, settle and feel like it was home. Now I have grounded myself and regrouped I have a new set of priorities, the uppermost being my own wellbeing. Silence hasn’t meant an absence of happiness. Over the last few months there have been some truly happy moments which I am grateful for. So this post will be a little update on what happened in my summer of (self) love. If you’ve read my blog you might know that I had a blissful time stretching in the Spanish sun last September. I liked it so much I decided join Nicole and the team for another break – a women-only wellbeing ‘retreat’ just down the road in Calpe. Along with the yoga and Pilates, we benefitted from access to a nutritionist, life coach and personal trainer. For a holiday that was billed as a ‘detox’ we ate really well. Our fabulous chef Jason prepared fresh meals for us every day as well as a morning smoothie and his own recipe granola bars. Above all, it was the people who made the break the joyful experience it was. Women of all ages sharing their wellbeing wisdom, supporting each other and learning together. We are truly blessed in Manchester to have such a diversity of events going on in and around the city. Manchester International Festival, which runs in alternate years, always brings a cunningly curated line-up to the city. 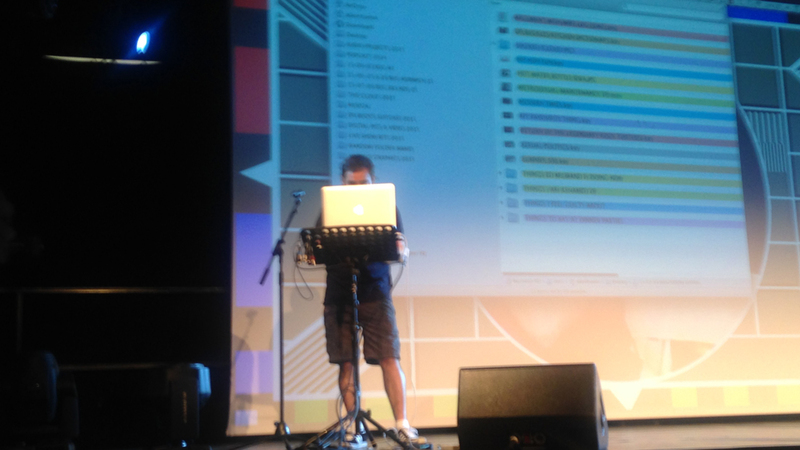 This year I had the pleasure to see perfomances by comedy god Adam Buxton (pictured) and quirky Icelandic songstress Bjork, as well as taking in the excellent Tree of Codes dance production – an explosion of colour, movement, mirrors and magic. The parent organisation of Manchester Girl Geeks, Girl Geek Dinners, has been going for a decade. Massive respect to Sarah Lamb who founded Girl Geek Dinners – there are now ‘chapters’ in over 20 countries worldwide. Manchester Girls Geeks joined in the birthday celebration with their own distinctive brand of girl geekery. This included Raspberry Pi polaroid-style photography (props to @MiniGirlGeek & @elsie_m_) and tech swag pass-the-parcel (thanks to @angieokchan for packaging). Congrats to @GillKiernan for her ‘Pi’ cake which won the bake-off and very deservingly. At the time of writing there are just a few tickets left for the next Manchester Girl Geeks event on Sunday 20th September, when materials scientist Dr Suze Kundu will be running a hands-on session.